Whenever somebody looks forward to a fun-filled and chilled out beach vacation in India, the most common name that springs to everyone’s minds is Goa. It is the place where party never ends and the sun never sets on fun & frolic. Goa is a land of festivities, and celebrations are a way of life here. Famous for its beautiful beaches which are dotted with swaying palm trees and an amazing nightlife, it’s a place embraced by happiness. However, there is much more to Goa than its beaches. It combines the charm of the old world with the glamour of the modern age. Casinos exist side by side here with churches, perhaps the oldest in the country. It surprises its guests with unique experiences. One such experience is a tour to the spice plantations where the visitor is introduced to everything about spice. 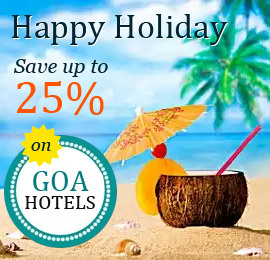 This is the reason why Goa is visited by honeymooners and families throughout the year, and particularly so during special occasions like Christmas and New Year. What is fascinating is the fact that every beach offers an experience different from the other. From Dona Paula to Colva and Majorda, every beach is a delight in itself, either offering spectacular views or thrilling water sports like parasailing, Jet-skiing and windsurfing, among others. The museums too, offer a valuable insight into its past history and heritage. The cultural aspect of this state is on full display at Goa’s Institute Menezes Braganza. Another major attraction are the forts, most of which offer magnificent views of the Arabian Sea and are repositories of history.